If a respondent reports more than one ethnicity, the ethnicity attributed is determined according to a hierarchical classification of Māori, Pacific Island, Other and then European/Pākehā. This is out of the Household Incomes Report which uses data from the Household Economic Survey conducted by Statistics NZ. I was reflecting on Greg Newbold's comments yesterday about Maori violent crime stats being too high. Statistics NZ also collects and publishes crime stats. Based on the above "hierarchical classification" if you do anything wrong and are of mixed ethnicity, it's the Maori bit of you that did it. "We put a lot of time and effort into dealing with poverty and we consider it far more of a priority than the members opposite, who have given their spokesman the opportunity to ask questions in this House on only three occasions this year." Now that rather surprised me so I thought I'd check the veracity of the claim. It's right and it's wrong. Prior to yesterday she had asked all of 4 questions this year - 3 relating directly to poverty and another indirectly. 'Arts, recreation and other services' adds more than 10,000 jobs? I was just having a look at the HLFS tables released today. Table 7 (cont) shows that the 'Arts, recreation and other services' sector added over 10,000 jobs in the March quarter. That's an 8% percent rise. But I'm suspicious because the jobs were nearly all male. The male numbers went from 64,700 to 74,900 from Dec 2012 to March 2013. They look entirely out of place sequentially. The rise for females went from 66,200 to 67,100. Can anyone think of something that's occurred to explain the leap for males? When I look back, a similar jump happened to females in the same period Dec 2011 - March 2012. Does Creative NZ suddenly release a lump of funding? But again, why the big difference in genders? 10,000+ is a big jump when you consider the total increase across all employment was 34,700. Only one other sector out-performed Arts etc and that's the largest (Professional, scientific, technical, administrative and support services) with one quarter million employed. Their increase of around 12,000 jobs was only a 0.5% rise. Just returning your email re the HLFS Arts,recreation and other services estimates. Firstly, yes those numbers are correct. Secondly, we advise looking at the change in unadjusted data , such as industry estimates, over the year rather than over the quarter. This removes any seasonal pattern from the data. Although breaking down this industry by sub industries means the estimates are quite small, we did see a notable rise in the repair and maintenance, the artistic activities and the gambling activities sub industry groups over the year. Again, who should pay for political advocacy? In an editorial not dissimilar to my post earlier in the week about who should fund political advocacy, the NZ Herald says, not taxpayers. There should be no rebates for donations for political advocacy and there is no need for a debate. A problem remains and I've commented to this effect. What would you do then about an organisation like the Salvation Army, which does charitable work by your definition but also a good deal of political advocacy? The issue is not as clear-cut as the writer would have us believe. It’s my son’s 19th birthday. So I retrieved the newspaper kept from the day of his birth. My younger daughter reads the TV schedule over my shoulder. 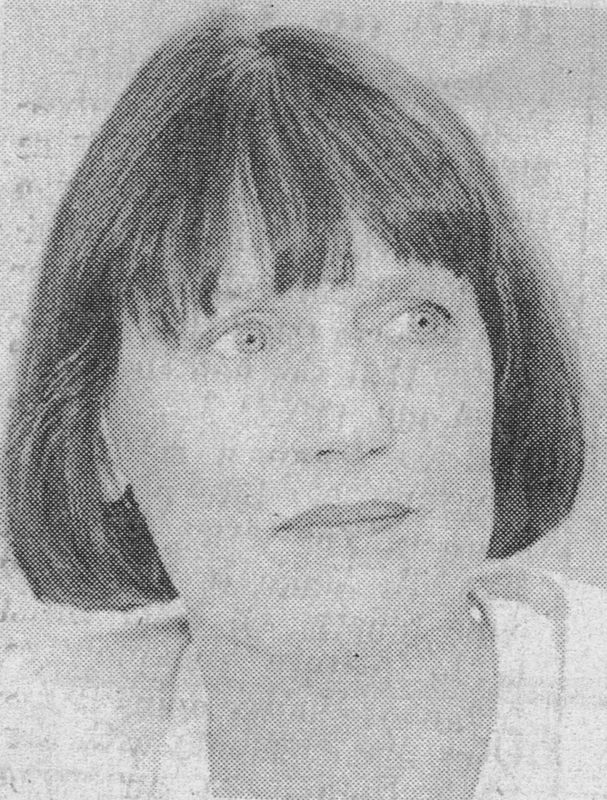 Then we laugh over a photo of a very young Helen Clark aiming to make Labour “… the biggest party in Parliament”. She did, temporarily, but she’s been and gone. Like Margaret Thatcher though, she left a legacy. Who should pay for political advocacy? I asked the question yesterday, how come an advocacy outfit like the Child Poverty Action Group retains charity status while an advocacy outfit like Family First loses theirs? Simon Collins is doing pretty much the same in the NZ Herald and has listed a few others. It seems to me that either all political advocates should get charitable status, or none. There are plenty of taxpayer funded political advocates like the Families Commission and the Children's Commissioner. We have no choice about 'donating' to these lobbyists. So perhaps it could be argued that we should also be able to easily donate (meaning get a rebate) to groups who represent our own particular viewpoint. But then why shouldn't other commercial interest representative groups also claim charity status? Outfits like Federated Farmers or Business New Zealand? Their members pay for political advocacy on their behalf. But I am forgetting. They are about profit, and profit and political advocacy should never be mentioned in the same sentence. The underlying problem is the size of government. If it didn't pretty much monopolise spending in the social sphere, there would be no need for the degree of political pleading that goes on. 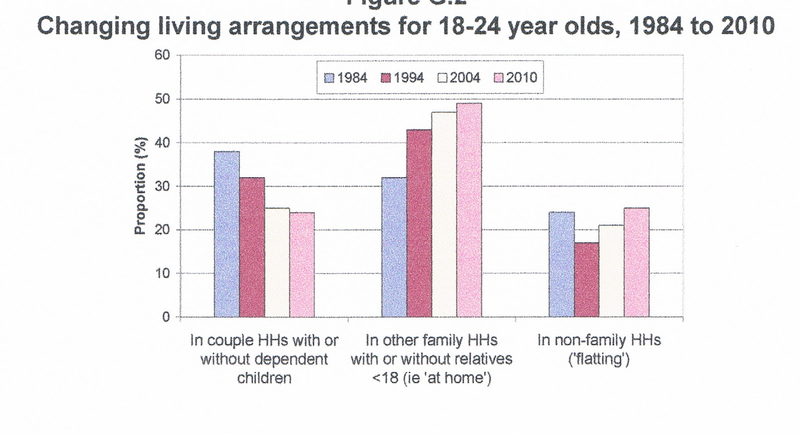 The graph below comes from the Household Incomes Survey and shows that a decreasing percentage of 18-24 year-olds are partnering and setting up home together. 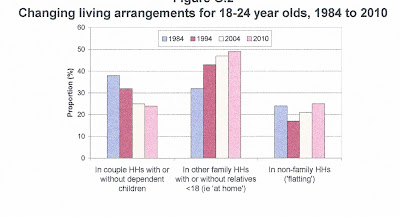 Increasingly they are staying home (almost half) and a similar percentage to 1984 are going flatting. The pattern is certainly borne out in my family. I left home to live in a flat with my boyfriend at 18. My oldest is now 19 and showing no signs of leaving home. 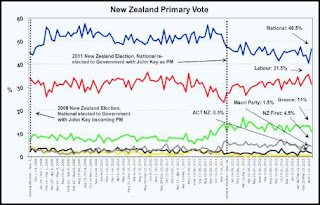 Why can the US report jobs data for April while in NZ we are still waiting for jobs data from March? Isn't bullying just as bad when the mob turns on the bully? Is the rapid rise in the use of long-acting contraceptives partly to blame for the drop in births from 64,315 in 2010 to 61,568 in 2012? And on that issue, what's worse? An STD or an unwanted pregnancy? How come an advocacy outfit like the Child Poverty Action Group retains charity status while an advocacy outfit like Family First loses theirs? Is being made to pick up dog faeces abuse? I have to do it every day. Aren't pukekos native birds? So where's Gareth Morgan now? Voters react to Labour/Green power policy? 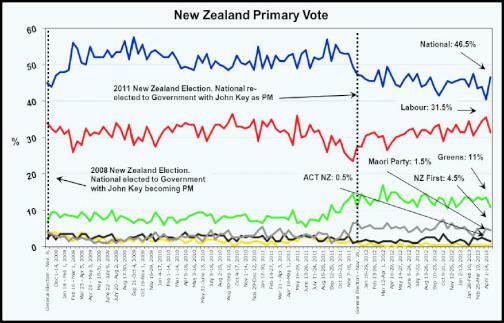 Strangely it fails to mention the Labour/Green power policy also announced during this period (April 15-28) which is likely to have far more effect on voter choice.